Model rocketry was developed during the “space race” era as an alternative to the amateur rocket activity—involving metallic airframes and the mixing of dangerous propellants—that was responsible for injuring and killing numerous young scientific experimenters. How to Build a Model Rocket. 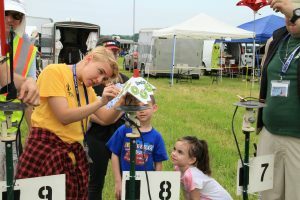 Model rockets are constructed of much safer materials—such as cardboard, plastic, and balsa wood—and are fueled by rocket motors manufactured by professional concerns. These rockets may be flown over and over simply by replacing the used motor with a fresh one. They typically contain a parachute, streamer, or other recovery device that allows them to land gently. The modeler need never mix, pack, or work with explosives or propellants. Today, model rocket kits and motors can be purchased in almost every hobby shop and toy store. Kits are designed for all ages and all levels of challenge, from simple starter kits to complicated scale models. Motor power ranges from “1/4A” (the smallest) to “G” —enough power to lift a six-foot model and a hefty payload! Model rockets must be flown in compliance with the Model Rocket Safety Code. Check out the current records for model rocket performance here.